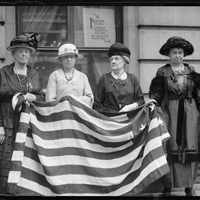 There was much turmoil throughout the early years of the United States that ultimately resulted in the official declaration of war against the United Kingdom by the US Congress at the behest of President James Madison. At home, Americans on the frontier faced attacks by Native Americans backed by the British. At sea, American merchant sailors were captured and impressed into service for the Royal Navy. In political circles, American leaders were keen to take Canada in order to expand our new nation. Add in local rebellions, expeditions that would result in continued westward expansion, and the admission of two new states, and the situation was prime for another conflict between England and her former subjects. The War of 1812 was primarily fought at sea. Warships and privateers from both sides routinely fought and captured merchants. The British managed to blockade American ports, and they turned that advantage to land for several well-known raids such as the attack on Washington, DC that resulted in the burning of our White House. They also sought to limit trade between the United States and France, allies from the American Revolution, and another country that the British were engaged in fighting through the Napoleonic Wars. The British saw many early victories, including repelling the American attempts to invade Canada. However, later American victories moved both countries to start peace treaty talks in August 1814. After months of negotiations, the Treaty of Ghent was eventually signed by diplomats representing both nations on Christmas Eve in 1814. It was ratified in Britain just three days later, but took until February 17, 1815 to arrive in Washington for ratification. During that period, future president Andrew Jackson would win a major victory over remaining British forces at New Orleans. Today, the War of 1812 is primarily remembered as the source of our national anthem that was written during an attack on Baltimore at Fort McHenry. Many also remember the story often associated with First Lady Dolley Madison saving some treasures from the White House which would end up burned. However, the military victories and causes of war are largely forgotten. In Canada, the history is more readily shared, as they successfully turned back an American invasion. In Britain, most history of the time focuses on the European conflicts with France rather than the war across the Atlantic. The N.S.U.S.D. 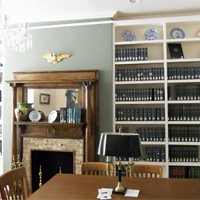 of 1812 hosts a library with many holdings on genealogical research and scholarly studies on the War of 1812 period and a museum dedicated to the 1784-1815 time period. Find you ancestor or learn more about his/her life during the War of 1812! On your next visit to Washington, learn more about this important time period!